When you get ready for a swim and notice the water level of your pool has dropped, you might be wondering if it is due to a leak or evaporation. Trying to fix a leak when there is none is costly and time-consuming, but failing to address an actual leak is even more problematic. Thus, the first step is to determine why your pool is losing water, and using a bucket test is a great way to do this. First, fill your pool up to its normal level. Next, take a 5-gallon bucket and fill it with pool water and submerge it approximately six inches in the water. 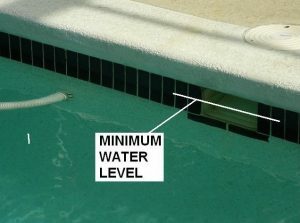 You want to mark the water level on both the pool and bucket. After 12 to 24 hours, check the water level. If the bucket and pool lost an equal amount of water, it is likely due to evaporation. Grand Slam Pools provides pool service naples fl for all types of leaks and pool maintenance. Contact us today to asses any pool issues you may be having and provide our Grand Slam Service Plan. Once you have determined your pool has a leak, it’s vital you locate it as soon as possible. Although this might seem simple, it can be complex and challenging. Before you do anything else, check the obvious. Walk around the pool and check for unusually wet spots or signs of damage. Check the pool equipment and filters. This method only applies to pools that do not have a vinyl liner. Turn the filter off and notice if the water level drops quicker than before. If the water level never drops below the skimmer, the leak is likely either in the skimmer itself or the filtration system. If the water level stops dropping at the light, there is likely a problem with the housing. Leaks coming from the filter might not cause a significant drop in water level, but they can add up over time and should be addressed. Again, you want to check obvious places first. Look for leaks around the hose or tank. If the leak is coming from the hose, you can choose to either repair it or replace it. While you might want to repair, it is not always effective. If the repair is not done properly, your hose will start leaking once again. Thus, replacing the hose is recommended. If the leak is coming from the tank, you might have to replace the entire filter. But if you have a split tank filter, check the belly band first. Take the band off and inspect the o-ring. If it is dirty, clean it and put it back in place; dirt can prevent the o-ring from seating properly and result in a leak. 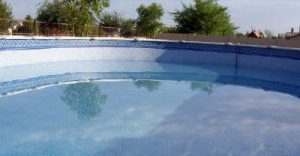 While pools with a vinyl liner are cheaper than standard pools, they are prone to leaks. If you have a vinyl liner, check the inside of the pool for bubbles, which indicates the location of the leak. Next, buy a repair kit if you don’t already have one. Cut out a small circle-shaped patch about six times the size of the leak. You want to apply the adhesive and stick the patch over the leak and hold it in place for a few seconds. After you secure the patch, note the current water level, and check it again in 24 hours. If the water level is still dropping, check for additional leaks. If no other leaks can be found, remove the patch, let it dry, and reapply it. Finding and locating a leak is challenging and time-consuming. If you are unable to repair the leak efficiently, you will be wasting time and money. If you are experienced with pool repair, you should be able to handle the leak on your own. However, if you have never repaired a leak before, it might be beneficial to contact a professional. Grand Slam Pools was founded by Dalton Mixon, who based his business on honesty and integrity. Mixon and his team are dedicated to providing efficient, high-quality service to all their customers. If you want to ensure your pool is repaired properly and effectively, contact Grand Slam pools today. Their friendly staff will be happy to answer any questions you have with absolutely no obligation.